Amazing things to see, do and experience. THERE'S LOTS TO SEE AND DO AT KINGS CREEK STATION AND SURROUNDING AREAS. We have a variety of activities including quad bikes, helicopter flights and swimming at the station. the Kings Canyon rim walk, and the Catherine Springs walk in the Watarraka National Park. ask the friendly staff in the fuel shop or contact us at the station. Come and join us on an adventure you will never forget. 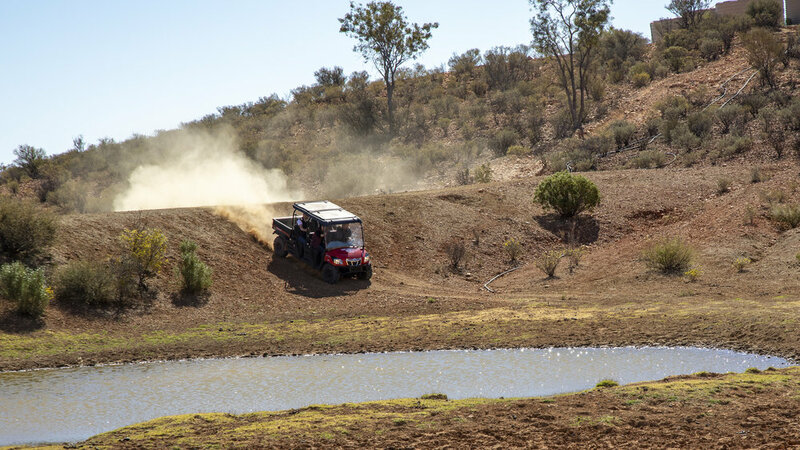 Ride a quad (four - wheel motorbike) and see the Outback as few others have before. Never ridden a quad before? No problems - all riders are given a detailed safety briefing and riding instructions prior to departure. Take a journey through magnificent Desert Oaks, cruise over rolling red sand dunes, weave through thick Mulga scrub and golden fields of Spinifex, pausing occasionally to shoot wildlife (only with a camera!!!). Your adventure takes you through part of our property where you may get to see some of our Santa Getrudis / Shorthorn cattle, as well camels, horses, and occasionally kangaroos or even the odd dingo. The birdlife is simply amazing, particularly in the early mornings. Learn a little about life on an outback station. Occasionally, pause to view the splendour of the George Gill Range. The colours at sunset are splendid – some have said it rivals Uluru (Ayers Rock) – just no crowds. For the person who wants a quick look around the dune country. Got a bit more time on your hands? What to see the unique Central Australian landscape up close? Learn about the station and visit ancient rock carvings whilst enjoying the freedom and exhilaration of riding a quad. Ever wondered what life is like living and working on a cattle station? Running twice daily, our station tour gives you the opportunity to learn all about outback life and the everyday workings of a station in Central Australia. Right on our doorstep lie Australia's spectacular Central Ranges, covering an area of 168,000 square kilometres. This vast maze of crags & canyons, rock formations & waterholes, craters and many more natural features are accessible only from the air. We have a range of flights available, from a 5-minute scenic flight to extended and exclusive charter. Up and over the George Gill Range to Bagot Creek; see the Central Ranges panorama; spot Uluru (Ayers Rock), The Olgas and Mount Conner on the horizon! An adventure that you will never forget. Cross over the top of the range to the remote Petermann Pound; Drop below the rim as you search for wild camels and horses. Fly along the top of the range to the breathtaking Carmichael Crag; then via The Lost City to Kings Canyon and the Garden of Eden. Return via Kathleen Springs, Stokes Creek and many other remote waterholes. See the desert, the ranges, the canyon, the waterholes and the wildlife. Just over the range is the most unbelievable visual experience that you will ever get in Central Australia. Unexplored caves, rock formations and waterholes where you see wild horses coming to drink. Remote, secluded and so much more spectacular than Kings Canyon. This is THE FLIGHT not to miss. This flight covers some of the most amazing scenery the Northern Territory has to offer, Including the spectacular Kings Canyon and the remote wilderness of The Middle Ranges and beyond, searching for wildlife and some of the hidden wonders this extended flight makes possible. Design your own private charter to Gosses Bluff, Palm Valley, MacDonnell Ranges, Alice Springs and many more destinations. Your helicopter, your choice.